Today’s pics are from Kizzie. Morning! What a beautiful Christmas hutch! Morning Nancyjill and morning Chas. Got some things done today. Just four more days of school before I head home. I’m ready, but that long flight is really lllooooonnnnnggg. Can you imagine sitting in a seat for eight hours and you still have six hours to go??? I must confess that the first sight of US soil brings tears to my eyes. It’s pretty, whatever it is. Good evening Jo. Chuck sat 15 hours in a flight from Tokyo. Jo, when you described the number of hours of sitting, I thought it sounds a lot like time in the chair at the tax office during the high season. No wonder when we go to the preparer seminars that most all the people are older and overweight. Thankful you get to come home and see your family. That makes the season brighter. The weather is cold here again. It’s like a pingpong ball bouncing around. Janice, when is your license due? That is such a sweet, “homey” picture Kizzie. I am glad you and Nightingale are making a home together. It can greatly workout. Not too long ago my cousin and I were remembering how good her grandmother’s iced tea was. This is worth watching to see George H. W. Bush at the end. Kim, after about three minutes, it was still downloading. Must be the entire program. I need renewal by the 12th, Cheryl. It takes about a week to get glasses from Sam’s where I got them. What a pretty cabinet and and decorations. 🙂 I think I’ll string something on my cabinet, too, after that bit of inspiration. I saw a photo on FB, too, Kizzie, and I love your wide-planked wood floors. I woke up at 6:20 this morning thinking “work.” Then I remembered. NO “work” this week. Yay! I let the animals out and slept for another hour, feeling no rush to immediately hit the shower when I did get up. I even made some coffee. Sweet. Today I’ll finish hanging curtains and do some decorating. Rain is supposed to come by 2 a.m. Wednesday and continue for 2 days, maybe. My friend and I planned to go to Knott’s on Thursday so we’re playing that one by ear. Every year they do a big outdoor Christmas festival with shopping that we love to stroll through. But they could get rained out. I’m game to go in the rain if they’re going to find a way to still be open, but I doubt my friend is that motivated so I may wind up going alone. We’ll see. It all depends on the weather — light rain shouldn’t be an issue. Five hours coast-to-coast is quite enough for me cramped on a plane in coach, which is all I can afford, thank you. Janice, is there any way you can go for your license and see if you pass? I mean, I know they test each eye separately, but a person with one good eye can still legally drive, right? Are your eyes similar enough that the good lens can help you see out of the other eye, if necessary? They take your photo without glasses, anyway. You can’t be the first person they have had in such a dilemma, but I would think if you still have one lens it might be workable, and I have a hunch they wouldn’t charge you a second time if you had to retake it (though you would likely have to wait in line all over again). Might be worth a try. They’d probably give you an extension, Janice? Ask Santa for glasses. My tax preparer is tall and lanky. 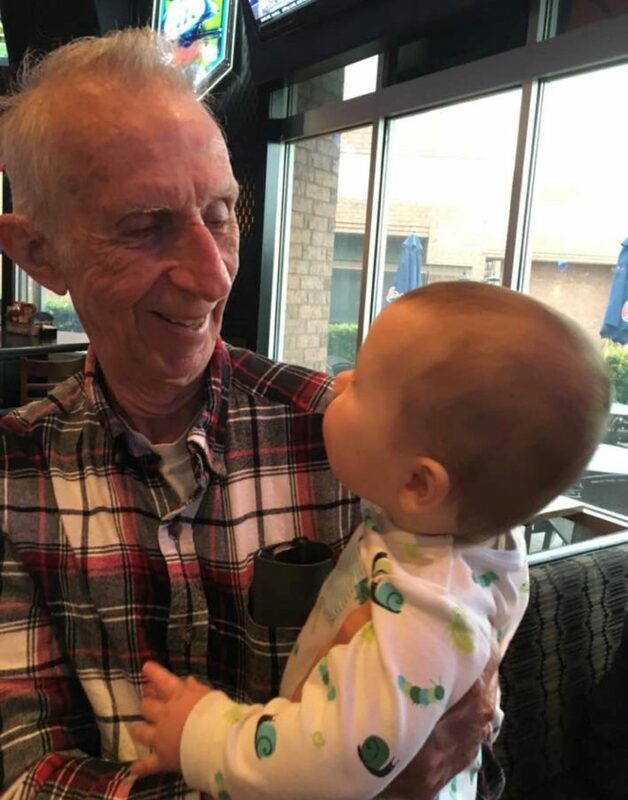 But I am thinking he may decide to retire one of these days, he’s in his early 70s, grew up across the street from us and has had his own CPA biz for years (his father also was a CPA). He’s been a coach for his kids & grandkids and was himself active in sports — plus he just has those tall, thin genetics. Sigh. We’re getting those stand-up desks at work which are very nice. I thought about doing that, Cheryl, since it is my bad eye that the lens dropped from. It is a long drive to the license place so I was hopeful for not more than one trip. If I can’t get an appointment then that sounds like a plan. I was out and about yesterday when I noticed the lens was gone. I thought that the lens must not be helping much since I had not noticed it missing. I have epi-retinal membrane which is similar to a cataract on the back side of the eye. My vision in the middle of the eye is gone. I also have cataracts on the front of my eyes. When I saw one of my cousins who lives in Florida at the funeral in West Virginia, she said she has ERM in both eyes. She does not drive at all. She is the only other person I have heard of having it. My friend Karen can’t drive at all due to double vision. Yay! I got the eye appointment for Thursday. I posted a little more on the prayer thread. I found a recipe for peanut butter mini cheescakes and wonder if anyone has made them and how they turned out. You put a vanilla wafer in the bottom of a muffin tin and then a layer of a cheesecake mixture. Finally you press a Reeces Cup on top and bake. It sounds good but only if it turns out pretty. Mmm, but I would like it in a large pan, please. Vanilla wafers and Reese’s cups. What could go wrong? And if it did, how would you be able to tell? Curtains up in the bedroom, they’re a faux linen semi-sheer, light blue, which I really like (though they’re too sheer alone for a bedroom, so the wooden blinds stay up behind them). Also Home Depot, not expensive but a little more expensive than their plain sheers. I wouldn’t mind using them also on one of my living room casement window pairs, though. Maybe later I’ll buy some for that. I need 2 more panels for better coverage in the bedroom, however, so it’s back to Home Depot for that today — I also need to return 2 rods that were too short while I’m there. I forget how much time these little projects take. Something Nightingale said made me change my mind about what I was going to get her, but an off-hand comment of hers led me to find and buy a charm for her stethoscope, and a pretty ornament for her tree that says something about nurses having caring hearts. A little background before I get to Chickadee’s gift. Back when she was about two years old, maybe even when she was three, she had a little pink t-shirt with a drawing of a cute bear, with the words “I Need a Hug”. She loved that t-shirt. So I had made a pillow out of it for her. A couple years ago, I looked at “I Need a Hug” t-shirts on Amazon, but there was nothing even remotely similar. Chickadee looked, too, and didn’t find anything she liked. So Chickadee can wear it if she likes, or she can make a pillow out of it if she’d like. I am hoping that she will be pleased and touched by it. I am very happy to have found it. After making my order, I decided it was time to change some things in my account information after I noticed that it still had our old house phone number. (We had given up our house phone earlier last year.) While I was at it, I also changed the email for notifications from Hubby’s to mine, and I changed the name on the account from his to mine. That made me a little sad. Fun finds for gifts. I love those personal touches, my mom passed that philosophy of gift-buying to me. And Amazon is pretty amazing for finding those ‘niche’ kinds of items. Well, looks I’ll need a new dog bed for the bedroom, I took the current one out, unzipped the cover to wash and the insides are a mess. It’s about 4 years old, so beyond time to replace, but … Ugh. It was a good ‘orthopedic’ one that Cowboy loved. Now he’s at a loss with no dog bed in the bedroom (which is where he hangs out most of the day). He’s pacing back and forth, wondering what to do with himself. Nightingale did most of the decorating, with some input from me. 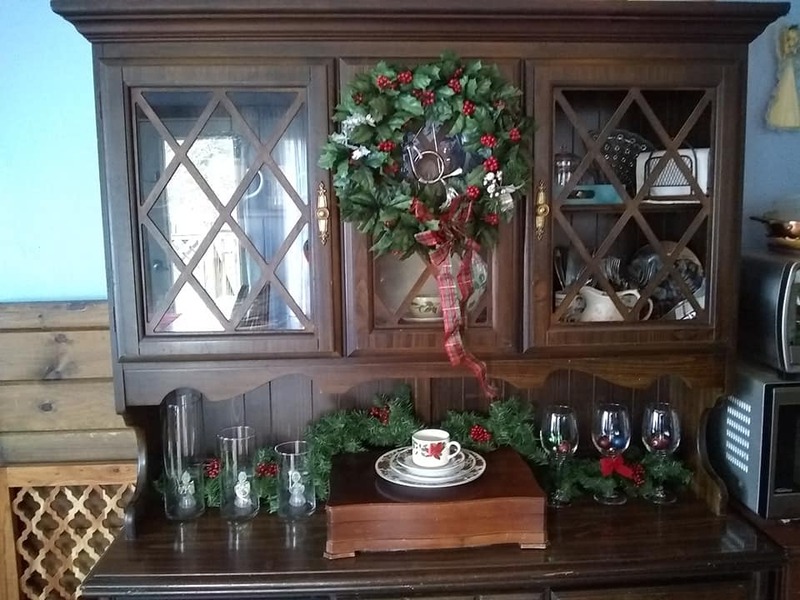 The coffee/tea pot and sugar and creamer on the tray were put there by me, and Nightingale did the finishing touches with the greenery and such. She did most of the hutch decorating. We also did some decorating in the living room, of course. We both like a classic look rather than the more trendy looks. And the ghost in the coat ! Oh nice, it’s a cacophony of ships horns coming up from the harbor, sounds like a couple of them are playing for each other back and forth. Some with a little melody, so fun. 🙂 Makes me want to drive down the hill to see what’s up out there. But she is wafting for the TV to end. I try to explain that TV doesn’t end, it just changes. This happens all the time. But she has always eventually left in the middle of whatever it is. It used to end with the Indian thing-y, right? And the Star Spangled Banner? Chas, can’t you take the remote and fade out the sound and make it end? I don’t remember the “Indian thingy”, but that that test pattern looks familiar. We never had the Indian thingy, just the test pattern and the Star Spangled Banner. I don’t think you could do the Indian thingy now, though. Maybe it was an LA item– I remember it. Nice photos, Kizzie, particularly the table. It may be late, but we can’t just leave 49 here waiting to be claimed.